Due to deteriorating weather conditions, and for the safety of MTA employees and customers, NYC Transit has begun an orderly shutdown of all elevated and open cut (exterior) portions of the subway system. The last trains to leave terminals have departed. The subway will operate underground only for the remainder of this storm. Staten Island Railway (SIR) will also be suspended. NYC Transit and MTA Bus local, limited and express bus service is currently suspended. Access-A-Ride service has begun an orderly shut down of service. 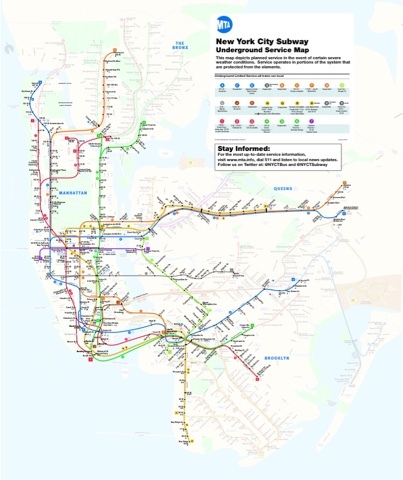 During the duration of this storm MTA Subway Time and MTA Bus Time will no longer be available. The MTA advises customers who do not have to travel to remain at home until the current weather conditions subside and roads cleared for safe operations. Crews from various subway divisions have been pre-positioned to respond to areas prone to weather related problems, and platforms are being cleared of snow and salted. The MTA fleet of deicer trains are currently running to keep rails free of ice accumulation and snow build up. The Snow Thrower and Jet Blower trains are also manned and are being deployed as necessary to remove any snow from the rails. These trains will be operating system wide during the duration of the storm.